The Communications Department is very proud to spread the news that a Directed Studies (CMNS 490) student, and Professional Formal Research Report Writing (CMNS 351) class were chosen for two freshly launched research awards at the University of the Fraser Valley. The new Community Service Research and Indigenous Research Award were announced this year and we are very proud that our students were nominated and won the awards. Each come with a $1000.00 cheque. The Indigenous Research Award went to a cohort of nine students in the community of Bella Coola who consulted together to create a report directed to the Nuxalk Nation board for education, NVIT for their program for certification as Chemical Addiction Workers (ChAd), and our own institution UFV which granted a block transfer from the ChAd program and delivered the balance of courses needed to gain a Bachelor of General Studies. The research report, titled Acwsalctimutilh, Yalctimutilh, Ksnmakaylaycilh: Tl’mstaliwatimutilh s Nuxalkmcilh** reviewed their experiences, honoured their learning, and made recommendations to all three institutions for continuation of program delivery in their own and other First Nation communities. The research and writing project was supervised by Dr. Marcella LaFever. The Community Research Award is in recognition of research by an undergraduate student who has partnered with an organization in the Fraser Valley. Korina Gratton, the premier winner of the award, worked with Chilliwack Restorative Justice (CRJ) to assess their website presence and make recommendations for improvement. Her onsite supervisor for CRJ was Leanna Kemp and her CMNS faculty supervisor was Dr. Marcella LaFever. 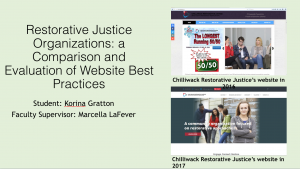 Korina’s purpose of the research, titled “Restorative justice organizations: a comparison and evaluation of website best practices,” was to analyze best practices for online environments; compare Chilliwack Restorative Justice and ten other restorative justice organizations’ web-sites against each other and the best practices, and recommend improvements to the CRJ website for better communicating, marketing, and overall appearance. 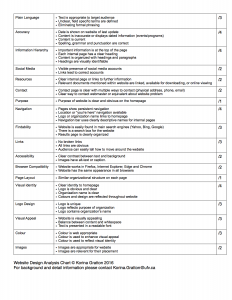 As part of the analysis Korina develop an 18 item grid*** for rating websites in relation to online communication best practices. 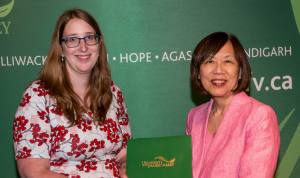 BTW – Korina was also nominated for the CMNS Undergraduate Research Excellence Award but could only accept one and chose the Community Research Award. 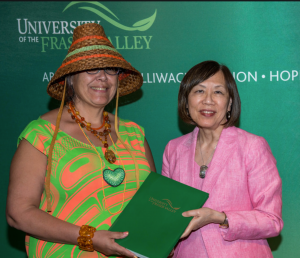 Korina Gratton receiving the UFV Community Research Award from Dr. Adrienne Chan; Ramada Inn, Abbotsford, BC. Our heartfelt congratulations to all the students!!! *Student Jim Dean Nelson passed on while in hospital just a short time before ceremony. He was awarded this and his Bachelor’s degree posthumously by the University of the Fraser Valley. Tl’mstaliwatimutilh = Living life to the fullest extent possible (includes struggle, support, learning /growing/healing, vision/future).